We know that many drivers expect the 2016 Toyota Corolla mpg ratings to be some of the best available in Central Illinois, but they are having a tough time competing. While the Corolla once regularly went head-to-head with the Civic, that’s just not the case anymore. We compared the Toyota to the latest 2016 Honda Civic to give you an idea of what modern small cars’ fuel economy ratings should be like. Most people think that a car has to either be more efficient or more powerful than a competitor and that you trade either efficiency or power for the other, but that’s not always the case. Sometimes an engine is just better. The 2016 Toyota Corolla mpg ratings max out at 38 highway and 29 city mpg for 32 mpg combined, and its 1.8L 4-cylinder is only capable of 132 hp and 128 lb-ft of torque. 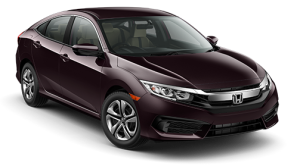 The 2016 Honda Civic LX Sedan with CVT, however, gets an EPA-estimated 41 highway mpg and 31 city mpg for 35 mpg combined,* and its engine is capable of 158 hp and 138 lb-ft of torque. Upgrade to the 2016 Civic EX-T Sedan with the new turbocharged engine and you’ll find an EPA-estimated 42 highway mpg and 31 city mpg (again for 35 mpg combined)* but a total power output of 174 hp and 162 lb-ft of torque. No matter which of the Civic’s engines you choose, it has a power and fuel economy advantage over the Corolla. We’ve just looked at the fuel economy and engine specs of these two small cars, but that’s just one of the differences between the Civic and the Corolla. See our side-by-side comparison of the 2016 Honda Civic and 2016 Toyota Corolla for a more expansive look at what these cars have to offer and what sets them apart from each other. Whether you’re just looking for the most fuel-efficient option or also want your new car to have the latest in standard and available amenities, we think the Civic is the best option for Central Illinois drivers. But you should see what it’s capable of yourself; visit a Central Illinois Honda Dealer near you today for a test drive of the new Civic.